Full on flavour! The family will love this wintery yet light supper. 1. In a large bowl, add the turkey mince, spring onions, ginger, red chilli, salt and 2 tablespoons of the hoisin sauce and mix well to combine. Roll tablespoonfuls of the mixture into balls. 2. Heat the oil in a large non-stick frying pan over medium heat. Cook the meatballs for 6–8 minutes or until browned. 3. Add the chicken stock, rice vinegar and remaining hoisin and bring to a simmer. Cook for a further 8–10 minutes or until the meatballs are cooked and the sauce has reduced slightly. 4. In the meantime, in a second saute pan, or wok, over very high heat, add the sesame oil and pak choi. Drizzle over the honey, soy sauce and water and stir fry, tossing, for 1-2 minutes until wilted but still crunchy. 5. 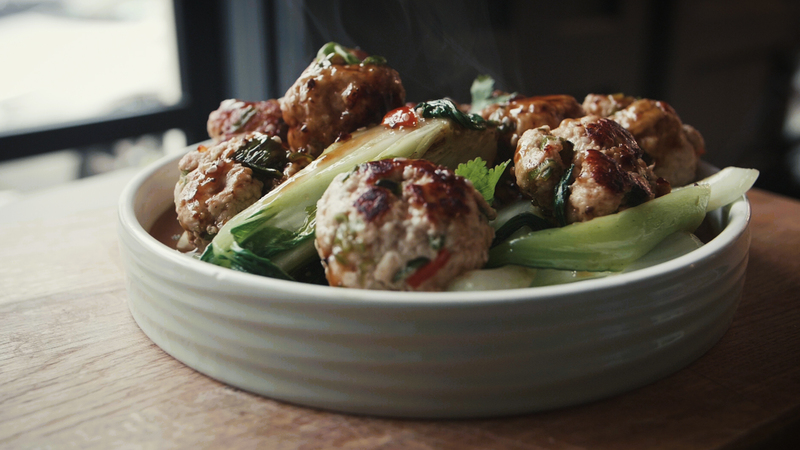 Transfer the pak choi on to serving bowls and pour the meatball and broth over. 6. Serve immediately with a sprinkle of sesame seed and extra green chilli. Loved this recipe, really simple and tasty.